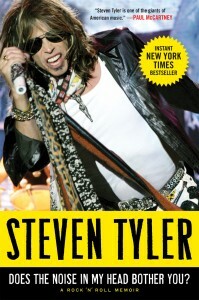 Steven Victor Tallarico aka Steven Tyler speaks, thinks and writes like he sings so it’s no surprise that his book turned out to be very stream of consciousness in style; a style this writer is especially fond of. But did I really want to step into the mind of Aerosmith’s legendary rock n roll frontman Steven Tyler to know what’s really going on in there? Turns out, I did. Does The Noise In My Head Bother You? is a journey through more than just a lead singer’s life in a band. It’s an adventure in life lessons from childhood antics to middle-age discoveries. It’s a love story between Tyler’s three main passions: music, money and girls (and then the things that those cause). Full of behind-the-scenes tales that make up the mechanics of his band, his family, his addictions and himself. Overall, Does The Noise In My Head Bother You? reads like a conversation where you’re doing most of the listening; complete with little interjections where Tyler tells you to go YouTube what he’s talking about right now. And it’s a conversation I’d partake in anytime. So Steven, you asked “Does The Noise In My Head Bother You?” and well sir – it does not.